Sometimes it’s pretty hard to find art and craft projects for the Lenten season. I have some here on Kids and Glitter, but I wanted to include more projects, those that also included the directions and patterns or printables, so you would have a larger selection of Lenten project for the kids. 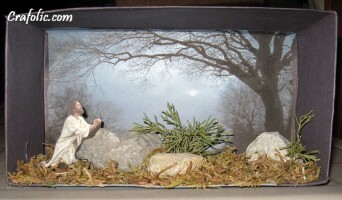 Click on the image to the left and you’ll get a full sized image of this beautiful diorama project from Catholic Inspired. That, and other great Lenten crafts, can be found at Lenten Arts and Crafts. This entry was posted in Categories and tagged christian art, christian crafts, crafts for kids, Easter, lenten, lenten arts and crafts. Bookmark the permalink.